Honda introduced the compact CR-V to the U.S. for 1997 to resounding reviews and great sales success. In fact, the company says it has stood as the best-selling SUV – of any size – for most of the two decades since. That phenomenal record puts a heavy burden on project leaders responsible for its redesigns during that period. And that holds for those involved in this, its fifth generation, due on sale December 21 as a 2017 model. Compared to the outgoing CR-V, the new one is slightly larger, roomier, and dressier, and it’s offered with a host of new features including its first turbocharged engine. It’s a little longer, taller, and wider than before, but the CR-V remains a compact SUV. Among its newly available features is a hands-free power liftgate. Let’s start with size and space. The 2017 rides a 1.6-inch-longer wheelbase with slightly smaller increases in overall length, width, and height. The combination affords two inches more rear legroom along with notable increases in cargo area, both with the rear seat up (+2 cubic feet) and with it folded (+4.9 cu ft.). 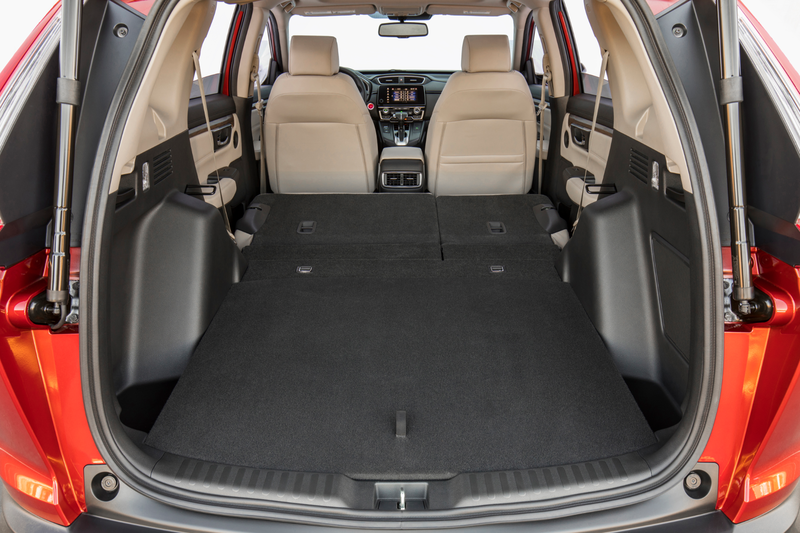 The latter results in a total capacity of 75.8 cubic-feet, a figure that puts this compact SUV on par with some 2-row midsize SUVs in terms of cargo space. Although “dressier” might be a subjective evaluation, there’s much to back it up. The interior is fitted with lots of soft-touch surfaces and is available in two-tone color combinations (black/grey and black/tan), and higher-line models boast rich-looking wood trim. Less subjective is the added available equipment. New features offered for ’17 include remote engine start, dual-zone climate controls, heated power mirrors, rain-sensing wipers, hands-free power liftgate, automatic high beams, and rear cross-traffic alert. Trim levels ascend through LX, EX, EX-L, and top-line Touring, all available with front- or all-wheel drive. While the base LX carries on with the 2.4-liter, 184-horsepower engine offered previously, all other models get a turbocharged 1.5 with 190 horsepower. Both are mated to a CVT automatic transmission. 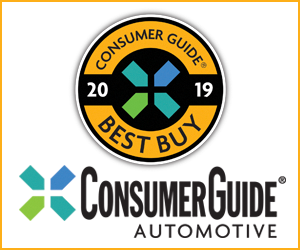 The case for the turbocharged engine is made not only in more power, but also better fuel economy: In front-drive models, it earns an EPA rating of 28 city/34 highway/30 combined; with all-wheel drive, it’s 27/33/29. In both cases, that’s 2 mpg better than with the LX’s 2.4. Lots of padded surfaces, two-tone trim, and rich-looking wood accents dress up the top-line Touring’s interior. While the LX comes fairly well equipped – including such features as a multi-angle (including 180-degree) rearview camera, capless fuel filler, automatic climate control, Bluetooth cell-phone link, Pandora capability, and text-message function – it’s the EX that brings many convenience and safety items most people want. These include heated power mirrors, power moonroof, keyless access and starting, remote engine start, auto on/off headlights, a power liftgate, 7-inch touchscreen, dual-zone automatic climate control, adaptive cruise control, smartphone-based navigation app and assistance system, Apple CarPlay and Android Auto, satellite radio, forward-collision warning and mitigation, lane-departure warning and mitigation, lane-keep assist, and blind-spot monitor. Added with the EX-L are auto-dimming rearview mirror, leather upholstery/steering wheel/shift knob, heated front seats, 8-way power driver seat with 4-way lumbar adjustment, and – optionally – a navigation system with voice recognition and traffic information. The top-line Touring brings the navigation system along with rear cross-traffic alert, rain-sensing windshield wipers, automatic high beams, and hands-free power tailgate. At the press preview in California, only higher-end models were made available. 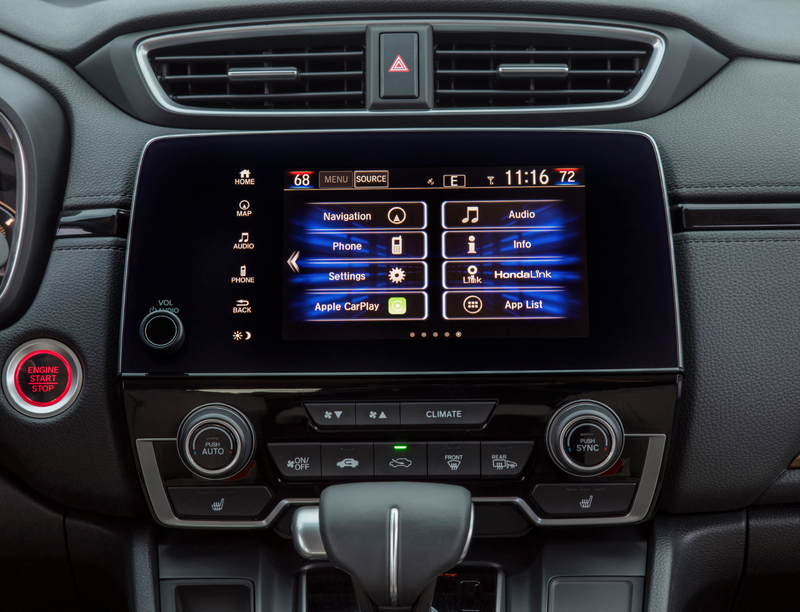 That means we weren’t able to test the LX’s base audio system – which includes a smaller 5-inch screen and more knobs and buttons – or its 2.4-liter engine. And that’s too bad, as those two items might be preferable to their counterparts in other trim levels. That’s the audio system’s newly added on/off/volume button just to the upper right of the red starter button; it replaces a much maligned “virtual” volume slide control. Other adjustments are through the 7-inch touchscreen, which is fairly logically laid out and easy to reach. In the last-generation CR-V, the “knobless” high-end audio interface suffered its share of criticism. (Other Hondas use something similar – with the same results.) So the company made a big deal that an on/off/volume knob had been added to the new generation. That helps, and though it still leaves much to be done through the 7-inch touchscreen, at least it’s fairly easy to reach and use. Climate controls include rotary temperature knobs but a less-convenient repetitive-step push-button for fan speed, and – worse – mode selection has to be done through the touchscreen. Granted, with dual-zone automatic climate control you probably don’t have much call to do manual adjustment, but it’s still nice to have simple knobs when you do. One problem with most small, turbocharged engines is that it takes a moment for power to arrive if you have to hurry away from a stop. In most driving, you don’t really notice anything lacking, which makes it all the more surprising when you slam your foot down and not much happens. And that’s the case here. However, full-throttle acceleration is quite linear if not overly strong, and the moaning engine leaves no question that it’s working hard to satisfy. On the plus side, “kickdowns” from the CVT automatic are fairly quick to arrive when the throttle is stabbed at speed, which isn’t always the case with CVTs. But Honda claims the ’17 with the 1.5 turbo is quicker than a ’16 with the 2.4, and then there’s those better EPA numbers to consider – so overall, perhaps the new engine can be counted as a plus. Honda says the new CR-V gains two inches of rear legroom, which was quite good to begin with. Easing egress are a convenient ride height and wide-opening rear doors. As the CR-V has never really been about “sport,” its chassis tuning tends to favor ride comfort over handling. Although California isn’t known for its poor roads (something that can’t be said for our hometown of Chicago), the CR-V seemed to ride quite smoothly. Handling was fine if still not really sporting – which is acceptible for this type of vehicle – and we appreciated the quicker steering ratio used for the new model (you don’t have to rotate the steering wheel as far to make the same turn). Two more notes in this vein. 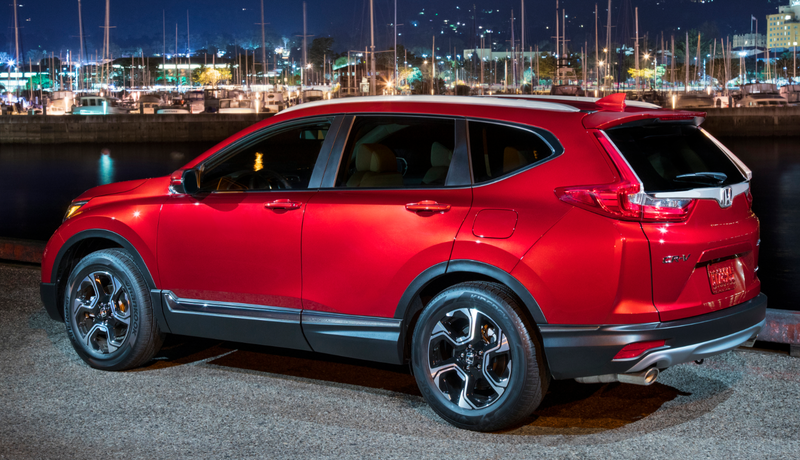 First, wind and road noise seemed low at highway speeds, and Honda says it has increased ground clearance by about 1.5 inches, leaving front-drive versions at 7.8 inches, AWD versions at 8.2 – the latter, especially, being pretty generous for a compact SUV. What the CR-V always has been about is space and utility. 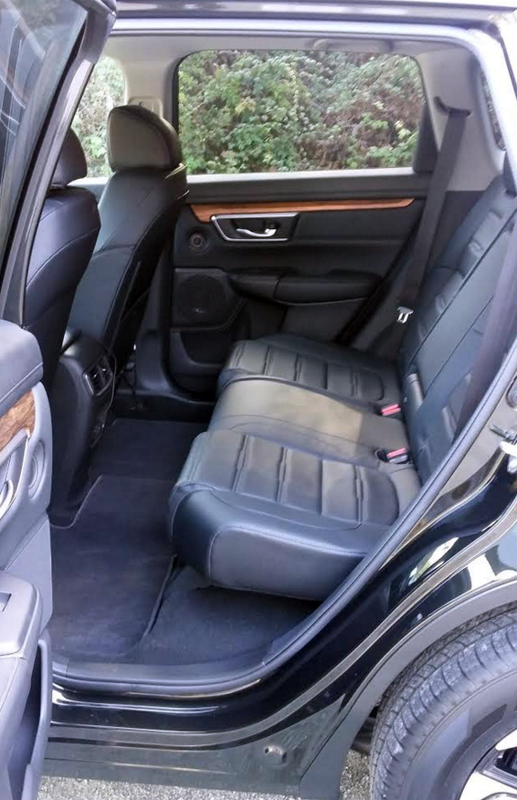 While really tall folks might wish for a bit more headroom and legroom in front, it’s really tough to criticize the room in back, as 6-footers should fit easily even with the seat ahead pushed all the way rearward. Furthermore, step-in height makes egress a breeze, which is aided further by rear doors that open nearly 90 degrees, far wider than most. Visibility is good except to the rear corners, where it’s only fair, though the standard 180-degree rearview camera really helps when backing. Interior storage is also very good. Although the highlight is a large, 2-tier console box that can be set to different configurations, it’s augmented by a moderate-size glovebox, a forward console bin, two console cupholders, a handy left-side dash bin, and map pockets with cupholders in the doors. At its raised level, the rear cargo floor lies flush with the folded rear seat backs, making it easy to slide long items forward. It can also be lowered a couple of inches to increase cargo-area height. Either way, there’s lots of space back there. Just as impressive is the cargo space. It’s wide at the rear and includes side bins, and the floor can be set at two levels: raised, it lies level with the folded rear seat backs and has underfloor storage space, and it can be lowered to take up the underfloor space and make for a taller load area. All but the base LX include a power liftgate, which can be easily adjusted for opening height. Spring for the top-line Touring, and the liftgate can be opened simply by kicking your foot under the bumper. 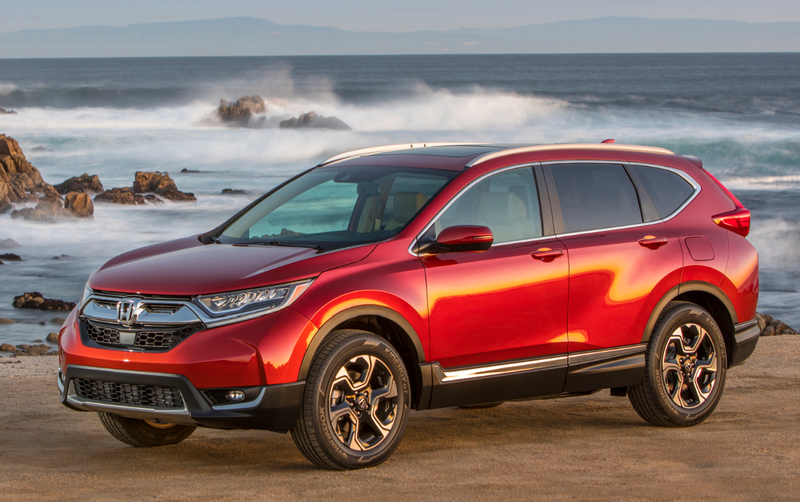 While pricing hadn’t been released at the time of this writing, Honda has always made the CR-V competitive in the class. As the rest of the vehicle is that and more, it’s likely this new model will continue the sales streak of the old. And to those charged with improving the next-generation design … best of luck. 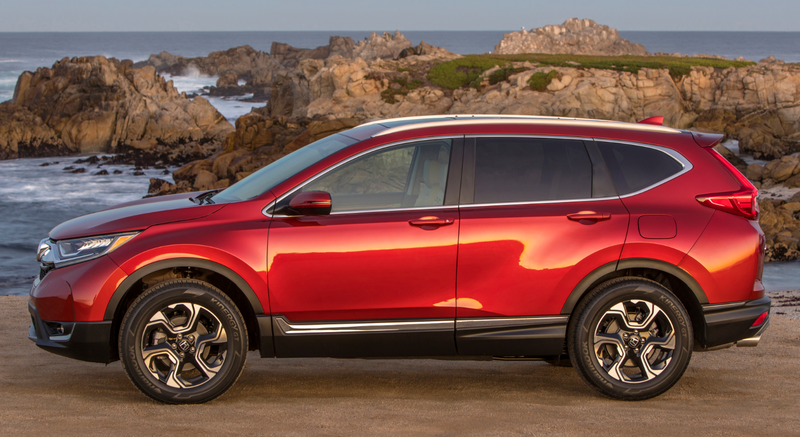 CR-V is the long-running sales leader of the compact-crossover class, and though others are in hot pursuit, we predict its newly added features and fine utility will help it maintain that treasured status. Written by: Rick Cotta on December 1, 2016.on March 22, 2019.